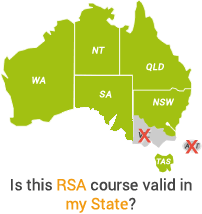 Thank you for your interest in the convenience of a bulk purchase of RSA Australia Online course logins. To purchase one of the above, simply click on the 'Buy Now' button. This will take you to our Corporate Purchases page where you can register or login and select the number of codes to purchase. You will then be taken to our secure payment processor Payway provided by WestPac Bank where you can use your credit card to complete the purchase. To apply for a Corporate Account please click on the 'Corporate Account' button below and fill the form.